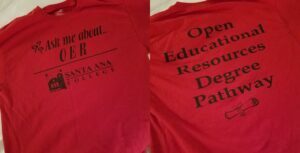 OER use at Santa Ana College (SAC) began in 2011 with the Kaleidoscope Project through the Gates Next Generation grant. With strong support from faculty, OER adoption amongst the college grew substantially. In 2016, SAC was awarded funding through Achieving the Dream’s (ATD) OER Degree initiative which has made it possible to offer two OER degree pathways: Associate in Science in Business Administration for Transfer and the Liberal Arts Associate Degree in Arts, Humanities and Communications. In addition, SAC received a California Community College Chancellor’s Zero-Textbook-Cost degree (ZTC) grant in 2018 which they are using to develop additional pathways in Physics and a Biotechnology Laboratory Technician certificate. SAC sustains a culture of innovation driven by its dedication to improve student success. Most are from cultures and backgrounds historically underrepresented in higher education: e.g., 69% are Hispanic/Latino. Low-income students continually struggle with the costs of education, and many choose not to buy the textbooks and attempt workarounds such as borrowing the book from the library or from a friend. Equitable access to instructional resources is a critical factor for making measurable gains in student success, especially among disadvantaged and underrepresented students. Changes in administration can have a negative impact on any program. The previous Vice President of Academic Affairs was a strong and vocal advocate for OER. A strong faculty presence in support of OER has allowed SAC to maintain the momentum during the administrative transition. The requirement for faculty to complete course mappings for their OER courses the semester prior to teaching presented significant challenges in timing and sharing. The OER team used encouragement and reminders to faculty regarding the program timeline. This helped, but some faculty were hesitant to share their course assessments and chose to leave the program as a result. Lack of dedicated support personnel for faculty developing OER courses was another challenge. The campus does not have a dedicated “OER” coordinator or staff. Instead, the program is lead by the Distance Education Director and a small but dedicated group of faculty who are allocated a small amount of release time to support the effort. All course materials for OER degree courses must have a Creative Commons license to qualify for the grant. This can be a roadblock in certain disciplines where essential course materials are only available through copyrighted or trademarked products. Specifically, popular modern literature required for English courses remains under full copyright for more than 70 years after an author’s death. Also, business courses require up-to-date commercial software programs such as Microsoft Office which are continuously being revised and make it difficult to keep course materials current. SAC had seedlings of OER courses in various disciplines but lacked the monetary incentives to support all the disciplines needed to complete a full degree. The ATD OER Degree Initiative was the mechanism that allowed SAC to complete an OER degree pathway. Being part of a large nationwide effort that was acknowledged and supported at the college gave the program key benefits. For instance, an instructional designer was hired for developing faculty model courses, and monetary incentives were provided for those faculty that needed that extra push. As the pathway evolved, there was an added incentive for departments to join and be recognized as part of creating this OER degree pathway for students. The process began with the creation of the faculty OER workgroup. These dedicated faculty were especially interested in the promotion of OER beyond their own classroom and have formed the core workgroup for the OER and ZTC degree implementation. The faculty workgroup included two science professors, a librarian, and the distance education director. A barrier to faculty involvement has been the time involved in adopting, adapting, and developing OER materials for their courses. Providing financial compensation has been the most successful method in gaining faculty buy-in for OER development. Anticipated to be a big draw for faculty adoption of OER is the creation of model courses. These model courses have been and are being developed with the subject expertise of discipline faculty and the assistance of an instructional designer. Since providing students with the capability to search for OER courses during registration, faculty have seen that the OER courses are filling more quickly than non-OER courses. Student demand is likely to lead more faculty to consider switching their courses to use OER. The OER faculty workgroup has been recognized by the Academic Senate as an advisory group for OER that can provide recommendations for best practices of OER implementation campus-wide and to oversee OER initiatives. 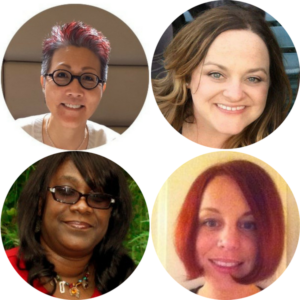 Hiring a lead administrator such as VP of Instruction to be an OER champion can effectively encourage administrator involvement from the top down. Building a strong faculty base of involvement in OER can be translated to administrative support as the faculty request to have their course developed and listed as OER. Seeking out external grant opportunities allows the college to become a key player within the OER community. The growth seen by campus administrators can encourage their involvement. OER faculty workgroup members present information at Associate Student Government meetings. Create and record student panels for conferences and workshops e.g. presentation at the Open Ed Conference 2017 and share videos on youtube. You can find links to all of the videos in the links section below. Building a good working relationship with SAC’s independent bookstore includes a process for printing OER materials which are made available to students for purchase at a low cost. 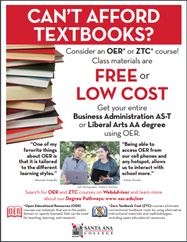 Provide library support for faculty who need to identify OER for their courses. Negotiated a portion of Faculty Librarian’s contract load to be designated for OER support projects. Overall OER textbook cost savings has been key. SAC estimates a savings of $1,074.500 with an enrollment total of 10,745 students for the Fall 2017 and Winter and Spring 2018 semesters. Twenty-six courses have been mapped for 2 full degree pathways with only three courses remaining to be mapped. SAC has documented improved student success in OER courses, evidenced by the first semester courses for the ATD OER Degree Pathway for Business Administration. The four courses offered during the first semester of the pathway were Communication Studies 102, Art 100, Business 150, History 120. The OER sections of the courses showed greater success (final grades of A, B, C) along with lower percentage of withdrawals (non-completion) than sections using traditional course materials. Santa Ana College (SAC) is known for its highly regarded academic programs as well as its top-ranked student services. A wide variety of courses are available in business, mathematics and sciences, arts and humanities, and career and technical education. SAC offers 273 degrees and certificates in credit programs. The college also offers 28 Associate Degrees for Transfer. In fall 2017, SAC began offering a bachelor’s degree in occupational studies. SAC ranks 19th among the top 100 associate degree producers for “total minority” students and ninth in associate degrees for Hispanic students nationwide, according to Community College Week in fall 2016. SAC Open Education Resource (OER) students John Dianito and Luisa Ortez, and professor Ed Fosmire share their experiences using OER in tomorrow’s episode of “Chicken Soup for the Soul’s Hidden Heroes” on the CW network. The piece focuses on how the Michelson 20 Million Minds Foundation has been instrumental in implementing OER and increasing access to education.